OLD PARKED CARS. 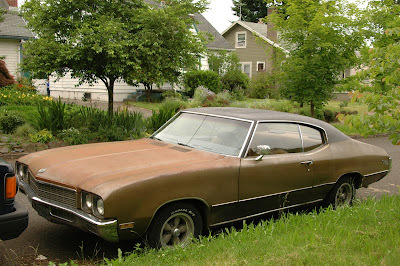 : 1971 Buick Skylark. Wow...amazing patina! I just love the way it looks with the lines of the Skylark. Also, those rims. I absolutely love these rims. You barely see them on cars, but I like them better than Cragars. An all around cool car. Man, that is one BAMF mobile. Great patina, great color, and well, great everything! The good ol' Buick. 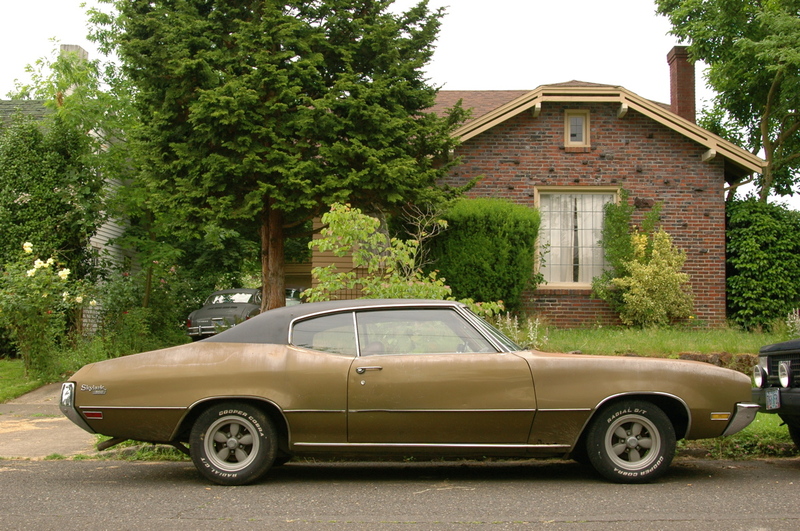 They were never quite the muscle cars like Pontiac and Chevy, but they still tried. Overall a really clean setup. I'd like to drive it as is. It looks like a lot of fun. Looks like a Karmann Ghia in the background of the 3rd shot, but I could be wrong. And behind that I see the curved window of a 50s GM... nice collection! Calvin: Definitely a Karmann Ghia, a 60s model: Older ones had square rear lights and newer ones much bigger lights. Looks like the one I have, a '63. 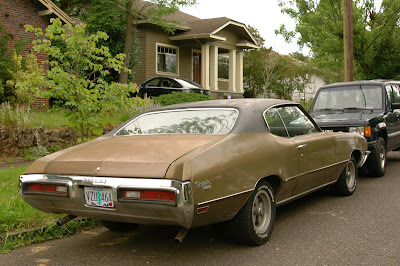 My first car was a '71 Skylark 4 door sedan. This car is a 1972 model. 1971 models did not have the black rubber strips surrounding the taillights. There should be black strips on the front bumper under the headlights also, front bumper was probably replaced with '71 at some time. That is definitely a '72 grill. "...The good ol' Buick. They were never quite the muscle cars like Pontiac and Chevy..."
The GSX stage I ! GS455 was a torque monster. They were expensive muscle cars and not in most kid's budgets. Luxury hot rods. The upper domestic price-range included luxury sales competition with Hurst Olds, Chrysler 300, Mercury Marauder S-55, Olds Toronado W-34, Buick Riviera GS, and Buick Wildcat GS. The comic book cars were for the youth buyer. GTO Judge, Plymouth Roadrunner, Plymouth Duster 340,and Dodge Super-Bee. These came with cute character decals. The Roadrunner was a bare-bones B-post 2-dr and carried a lower entry price than the heavier more plush Belvedere GTX hardtop.